We have a guest post from University of Melbourne M.Sc student, Ashleigh Henderson! The discovery and production of penicillin as an antibiotic in the early 1900’s was one of the most significant breakthroughs in the history of medicine. Antibiotics turned many menacing, life-threatening diseases into mere annoyances that could be solved with the pop of a pill. However, bacteria are fighting back and are rapidly evolving resistance to antibiotics. They are able to do this due to our misuse of antibiotics. There currently is very little regulation of the dispensing of antibiotics and as a result, too much is being used to treat human disease and in food production with food livestock being fed antibiotics merely as preventatives for bacterial disease (Choudhury, Panda & Singh 2012). Additionally, rapid globalization acts as a vector for spreading new antibiotic resistant genes due to population mobility and the transport of waste and food (Choudhury, Panda & Singh 2012). Evolution involves change over generations to confer a selective advantage for a species in a given environment. Thus, these bacteria are able to develop rapid resistance as their large numbers and fast life-cycles allow them to evolve quickly in their new antibiotic-saturated environments. The consequences of all this include longer length of illness, increased mortality; all leading to a huge burden on the healthcare system which in turn impacts on further advances in other areas of the medical field (Choudhury, Panda & Singh 2012). Thus, we are in a race against our microscopic foes to find alternatives. Although many new forms of antimicrobials are currently being investigated, one idea which has acquired interest over the last few decades is the use of bacteriophages (phages). Phages are small viruses that selectively target and kill bacteria (Wittebole, De Roock & Opal 2014). The main interest for phage therapy has been on lytic phages. 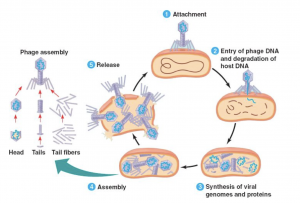 Lytic phages attach to receptors on bacterial cell walls, then inject their genetic material so that they can use the bacterial cell to replicate. 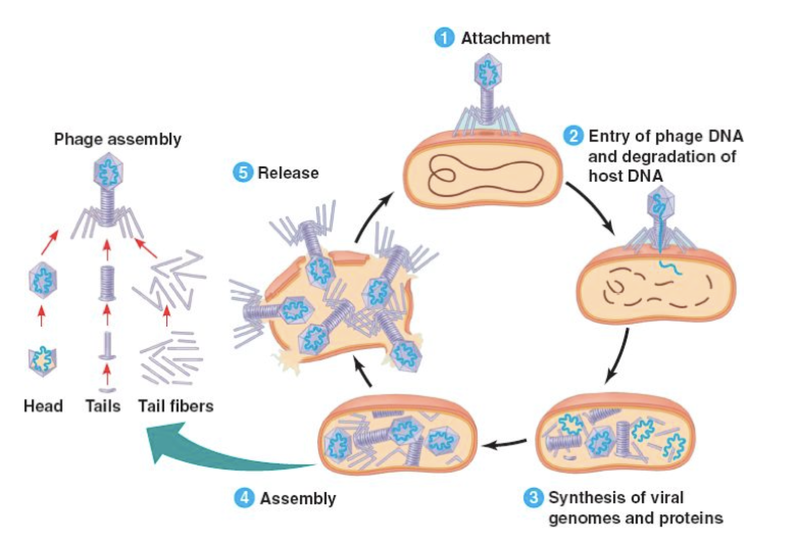 Once new viruses have been assembled they burst out of the bacterial cell to then go and infect more. (Wittebole, De Roock & Opal 2014). Many features of phages make them appealing alternatives to antibiotics. These features include their natural ability to target and lyse bacterial cells (Wittebole, De Roock & Opal 2014) and their specificity to their host (they only infect bacteria and not human cells) (Golkar, Bagasra & Pace 2014). Phages have not been reported to cause secondary infections or side-effects in humans (Golkar, Bagasra & Pace 2014). Also, while bacteria might develop phage resistance phages naturally counter evolve. (Golkar, Bagasra & Pace 2014). Phages are also potentially much cheaper antibacterials than antibiotics (Wittebole, De Roock & Opal 2014). There are two main ways that phages have been thought to treat bacterial infections. One method is for the phages to be used to directly kill the bacteria and thus end the infection, the other is to slow antibiotic resistance evolution by using phages in conjunction with current antibiotics. A Chinese biologist, Quan-Guo Zhang investigated the latter by looking at the impact of phages on the evolution of bacterial antibiotic resistance. When bacteria evolve to have a selective advantage against antibiotics, there are usually associated ‘fitness costs’, meaning that their ability to survive in their old environment has reduced. Thus, when the use of antibiotics has ceased, the antibiotic-resistant bacteria often have to revert back to their old selves due to getting rid of the genes that confer antibiotic resistance. Fitness costs are also associated with developing resistance to phages. Thus, Zhang tested the idea that the fitness costs for developing resistance to both antibiotics and phages would compound, resulting in slower bacterial antibiotic resistance evolution. However, despite the excitement surrounding this method for hindering antibiotic resistance, the results of this study showed that treatment of bacteria with phages does not affect the rate of bacterial growth or evolution of antibiotic resistance. In this study, they used two different bacterial strains with the bacteriophage. They compared populations of bacteria with and without phages in addition to with and without antibiotics. The bacterial populations were given time to grow and evolve. Then the antibiotics were taken away so the reversion could be studied. They found that, as expected, antibiotic resistance levels increased over time, but this did not differ within the phage-exposed and phage-free populations. During the reversion period it was found that the minimum dose of antibiotics required to kill the bacteria decreased over time, as antibiotic resistance fell. However, again there was no difference between phage-free and phage-exposed populations in this minimum dose of rate of reversion. In regards to the fitness costs associated with antibiotic resistance, both phage treatment and antibiotic treatment slowed down bacterial growth rate, but exposure to phages only decreased the rate of antibiotic-susceptible bacteria which is not as clinically useful as decreasing the growth rate of antibiotic-resistant bacteria. Also, phage treatment did not show an impact on the increase of antibiotic resistance levels. This raises the question; is this an accurate representation of phages ability to act as an antibiotic? While Zhang’s study presents evidence that phages may not impact on antibiotic resistance evolution, they were able to show that phage treatment slowed growth rate of bacteria, lending insight into the possibility of the use of phages as a direct killer of bacteria. Further, the real-life application of Zhang’s study appears to be somewhat lacking. Zhang’s study only looks two strains of the Pseudomonas fluorescens bacteria, and perhaps a wider variety of common disease-causing bacteria might be more applicable. Also, all tests were done in petri dishes, as opposed to in humans. Perhaps this was due to the stringent regulation of testing on humans, but if phage treatment could be observed in patients with bacterial diseases, more relevant results may be obtained. Human trials of phage therapy are lacking and have mainly been confined to demonstrating the safety of phage treatment, as opposed to looking for any outcome of infection alteration. One study in the US in 2009 by Rhoads et al. demonstrated the safety of a phage cocktail in 42 patients. Another study in the UK demonstrated the application of a solution of six phages in the ears of patients with ear infections and showed reduced bacterial infection and no adverse reactions (Wright et al. 2009). Overall, while there is much excitement surrounding the idea of these microscopic warriors in defending us from bacterial disease, there is still much research needed to determine whether phages have the ability to battle bacteria for us or slow their evolution. This also includes studies into novel phage delivery systems and human immune responses to phages. Thus, if we are to start utilizing phages as a mode of antibiotic we need to act quickly , starting with more research. This can however only be done if some changes are made. Firstly, to give us more time, we need to ablate the spread of antibiotic resistance , which will include controlled use of antibiotics in livestock, clinical settings and increase education amongst healthcare professionals, the general public and patients (Lee et al. 2013). Also, there is currently a problem with economic feasibility; there is less incentive for pharmaceutical companies to develop antibiotics since they believe they will continuously be having to design new ones as bacteria evolve. Thus, we need to call the government to action to encourage researchers through incentive programs and funding to develop new antibacterial agents. Therefore, the current solution to this problem should involve the hindrance of bacterial evolution through education and stringent antibiotic use and innovative policy for researchers to discover new means of antibiotics. Main Article: Zhang, Q 2013, ‘Exposure to phages has little impact on the evolution of bacterial antibiotic resistance on drug concentration gradients’, Evolutionary Applications, Vol. 7, no. 1, pp. 394-402. (Zhang 2013). Article 1: Choudhury, R, Panda S & Singh D 2012, ‘Emergence and dissemination of antibiotic resistance: A global problem’, Indian Journal of Medical Microbiology, Vol. 30, no. 4, pp. 384-390. (Choudhury, Panda & Singh 2012). Article 2: Lee, C, Cho, I, Jeong, B & Lee, S 2013, ‘Strategies to Minimise Antibiotic Resistance’, International Journal of Environmental Research and Public Health, vol. 10, no. 1, pp. 4274-4305 (Lee et al. 2013). Article 3: Golkar, Z, Bagasra, O & Pace, D 2014, ‘Bacteriophage therapy: a potential solution for the antibiotic resistance crisis’, Journal of Infection in Developing Countries, vol. 8, no. 2, pp. 129-136. (Golkar, Bagasra & Pace 2014). Article 4: Wittebole, X, De Roock, S & Opal, S 2014, ‘A historical overview of bacteriophage therapy as an alternative to antibiotic for the treatment of bacterial pathogens’, Virulence, Vol. 5, no. 1, pp. 209-218. (Wittebole, De Roock & Opal 2014). Smith H & Huggins M 1982, ‘Successful treatment of experimental Escherichia coli infections in mice using phage: its general superiority over antibiotics’, Journal of General Microbiology, Vol. 128, no. 2, pp.307-318. (Smith & Huggins 1982). Rhoads D, Wolcott R, Kuskowski M, Wolcott B, Ward L & Sulakvelidze A 2009, ‘Bacteriophage therapy of venous leg ulcers in humans: results of a phase I safety trial’ Journal of Wound Care, vol. 18, no. 6, pp. 237-8, 240-3. (Rhoads et al. 2009). Wright A, Hawkins C, Anggård E, Harper D 2009, ‘A controlled clinical trial of a therapeutic bacterio- phage preparation in chronic otitis due to antibiotic-resistant Pseudomonas aeruginosa; a preliminary report of efficacy’, Clinical Otolaryngology, vol. 34, no. 4, pp. 349-57. (Wright et al. 2009).